I cut my hair on Friday. Well, I take that back. I had my hair cut on Friday. I sort of described what I wanted done. I usually take a picture with me, but lately it just seems like everything requires a lot more effort than normal. And searching for the picture seemed like it would take too long when I'd already spent half the morning trying to decide whether I should go get my hair cut or not. Do you ever do that? Spend more time fretting about something than it would actually take to go do the something? That's my life lately. And, while I'm on the topic, it seems like lately, too, that everyday things, like making a meal, turn the entire house upside down. I mean, I'm still trying to fly, but a simple bath tonite turned into a bathroom fiasco when the baby decided she didn't feel so well right after the older sister asked for all the bath toys to be dumped into the tub with them. Come on, seriously? Now I have to either disinfect all the toys or throw them all away and start over. And, really, who has that much disposable time or income to clean or to buy all new? But, again, I digress. So, I found Brandi. She's good. I mean, she cut my hair into a good style. But it wasn't an "It's-summertime-so-let-your-hair-go-short-and-sassy-so-you-can-climb-out-of-the-pool-toss-and-go" kind of cut. So, after fretting over it all weekend and spending way too much of my valuable time on trying to 'style' it, I decided to do something. That's right. I did. 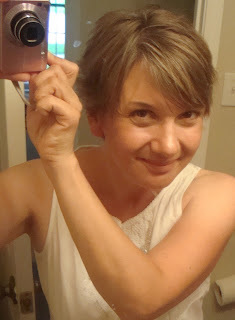 I grabbed a pair of Kindergarten scissors and my daughter's little MaryKay mirror. And with Baby S situated on my hip, I started to hack away, I mean cut my hair. And I hadn't eaten much for breakfast because I need to go to the grocery store, and really, with 4 kids, that's just a lot of work, and maybe I had a little too much caffeine and really not enough time because I'd fretted all morning about whether I should do something or not and it was time to make lunch out of...well, something. And, well. I just started cutting. And I laughed my tail off. Because, really? Only I would spend half my day trying to decide whether to go back and have Brandi fix it and the rest of the day trying to fix what I had done. To myself. And I don't actually think I look half bad. Shannon, I am not. But bathroom-mirror-self-photographer, apparently I am.